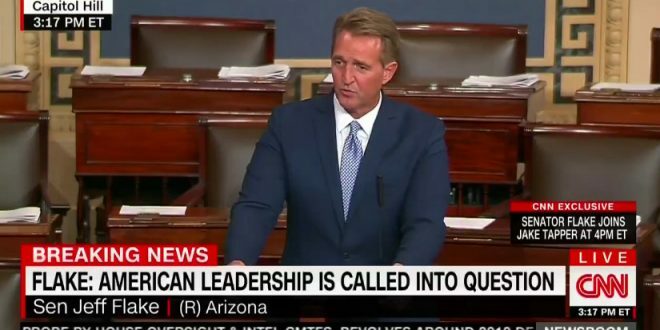 Sen. Jeff Flake Savages "Outrageous, Not Normal" Trump In Exit Speech: I Won't Be Complicit [VIDEO] - Joe.My.God. Sen. Jeff Flake, R-Ariz., announced Tuesday he will not run for reelection next year, saying he was appalled by President Donald Trump and the direction of the Republican Party. “We must stop pretending that the conduct of some in our executive branch are normal. They are not normal,” Flake said in a passionate speech on the Senate floor that was aimed clearly at Trump. The one-term senator faced a potentially ugly primary against former state Sen. Kelli Ward, a fire-brand conservative backed by former Trump strategist Steve Bannon who had previously challenged Sen. John McCain, R-Ariz.
“The personal attacks, the threats against principles, freedoms and institution, the flagrent disregard for truth and decency. The reckless provocations most oten for the pettiest and most personal reasons. Reasons having nothing whatsoever to do with the fortunes of the people that we have been elected to serve.” “Mr. President, I rise today to say, enough,” Flake said.